Auction Closed. Sold via Buy Now $800. Next Auction Monday, August 13. 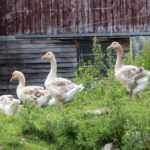 A Vermont barnyard is a busy little microcosm of sorts. Cows herd and goats gather. Chickens flock and geese gaggle. Each social syndicate seems to have their own important agenda. And within each group, individual personalities palaver and politic. Apparently we have a lot in common! It’s that time of the year again…the August edition of Chaffee’s Art in the Park. It’s this coming weekend, Saturday and Sunday, August 11 & 12. If you are in the Rutland Vermont area please stop by to say hello and to support the Chaffee. There are many wonderful artists and craftspeople participating. I’ll be there in my usual spot with several new original paintings, along with a large selection of prints. Here is one new original I’ll have on display. I started this large painting a couple of weeks ago at a Friday Night Live event in Rutland. “Gathering Storm” 24X64 Oil on panel. Both paintings are wonderful. So good to see you on the mend & back at work. “Free Range Geese”! Beautiful! Did not realize you have not been feeling well. Hope this finds you doing much better! All good now Joan, thank you! 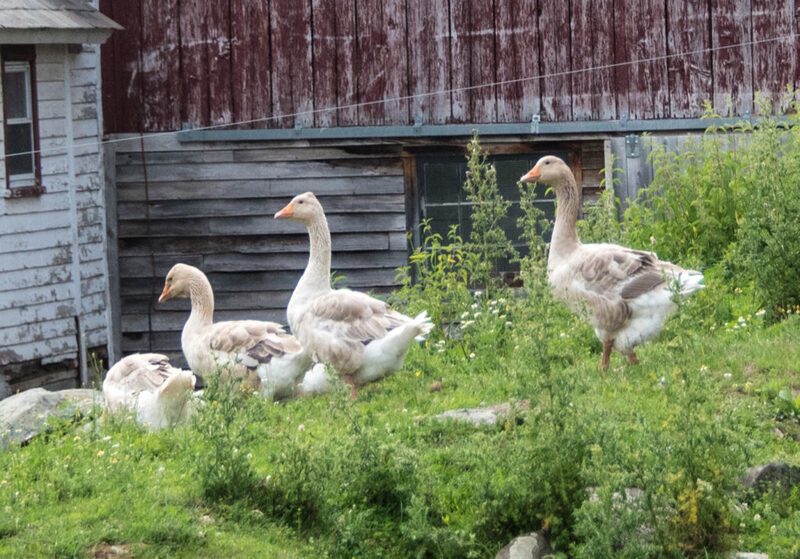 a lifetime ago my uncle kept geese as watchdogs (as well as dinner) and “Barnyard Society” puts me right back thee. I love it. This is wonderful Peter! I think the ducks must be high society in the barnyard! I love the way they walk and talk with their quacking and their heads held high! Thanks so much for sharing this with us! One of your forever friends! Wish I were going to be in Rutland to see Gathering Storm in person. It must be magnificent in its large format! Not surprised at the quick sale of this weeks auction painting. It is powerful in its composition and pleasing use of “many shades of gray!” You keep getting better and better! I just framed it today Brian…its a big one. Thanks! I can’t love Barnyard Society enough!!! Very calming, beautiful painting. Well done you!!! Are three geese a gaggle? I don’t know but these three are fantastic. I love your scenes, but when you capture close-ups of the geese, your owl and flowers with a butterfly, they make me smile even more. I look forward to seeing you at Art in the Park. No idea either.. As an artist all I know is three is a good number. I try not to get bogged down in facts. 🙂 Thanks Judy! so sweet and homey! 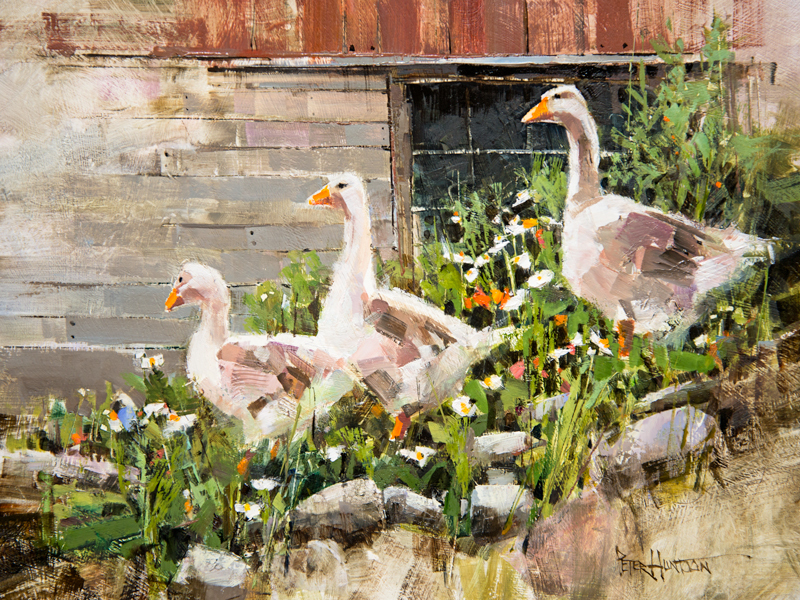 a gaggle of geese…perhaps very nice Peter! I love your art…so glad I subscribed. “Barnyard Society ” hooked me.